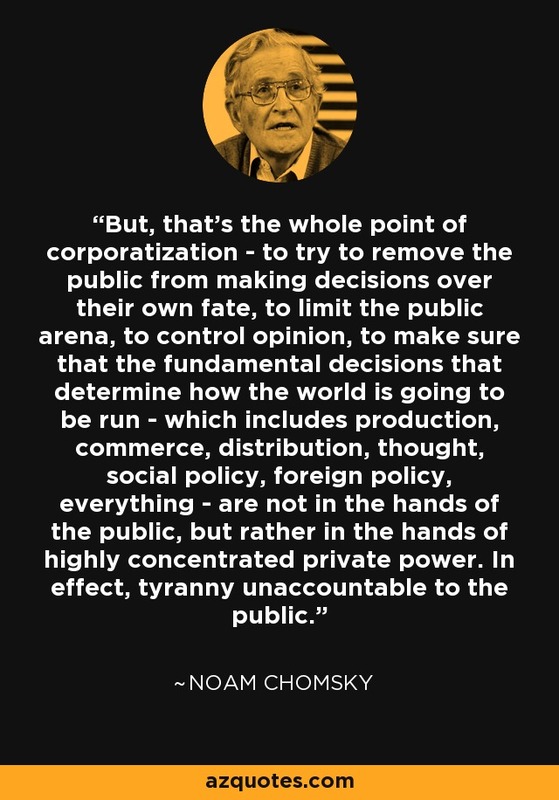 But, that’s the whole point of corporatization - to try to remove the public from making decisions over their own fate, to limit the public arena, to control opinion, to make sure that the fundamental decisions that determine how the world is going to be run - which includes production, commerce, distribution, thought, social policy, foreign policy, everything - are not in the hands of the public, but rather in the hands of highly concentrated private power. In effect, tyranny unaccountable to the public. "On Microsoft and Corporate Control of the Internet". Interview with Anna Couey, chomsky.info. May 6, 1998.